The angled connector provides a stable hold inside the USB B female port and can be used especially for ports which are difficult to access. Make plug and play connections for such devices as keyboards, mice, modems, printers, and other USB peripherals. USB2.0 cables provide transfer rates up to 480Mbps; and easily attach to any USB device. A to B cables are used to connect from your USB port on Hub; PC or Mac to your USB device such as printer or scanner. USB Type A Male to Type B Male. Transfer rates up to 480Mbps depending on USB version. Make plug and play connections for such devices as keyboards; mice; modems; printers; and other USB peripherals. PC and Mac compatible. Compatible with USB specifications 1.0; 1.1; and 2.0. Length: 1ft. USB type B Female to USB type B Female. Type Coupler Adapter. Fully molded design provides durability. Gold plated contacts provide excellent signal transmission. Ideal for extending your existing USB cables to your needs. USB type A Male to USB type B Female. Type Coupler Adapter. Fully molded design provides durability. Gold plated contacts provide excellent signal transmission. Easily convert existing cables to your needs. USB A to B cables are used to connect PC to mobile devices such as phones, mp3 players, cameras, etc. 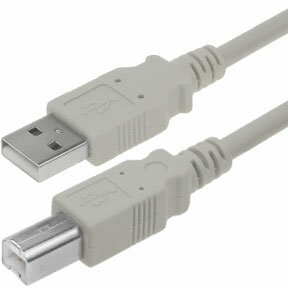 These USB 2.0 A Male to B Male cable are perfect for printers that do not come with cables or needs a longer cable for a remote location. You can select from our wide range of products to facilitate your connections. We have different combinations of A Male to B Male Cables, A Male to B Female adapter, A Male to B Female Cable with Ferrite, A Male to B Male cable with LED, and many more products. We are very particular about the quality of the product hence make sure that the products are sourced only from ISO 9001-2000 registered manufacturers. We also provide good after sales service and lifetime technical warranty on our products.